An award-winning lemon curd, unparalleled for flavor and texture. Curds are intensely flavored fruit butters. In late 19th and early 20th century England, lemon curd was traditionally served at afternoon tea with scones or bread as an alternative to jam. Simple and natural, curds are usually made of lemon, lime, raspberry or orange, with the addition of eggs, sugar, butter and zest . The ingredients are cooked together until thick, then allowed to cool, forming a soft, smooth, intensely flavored spread that has many delicious uses. 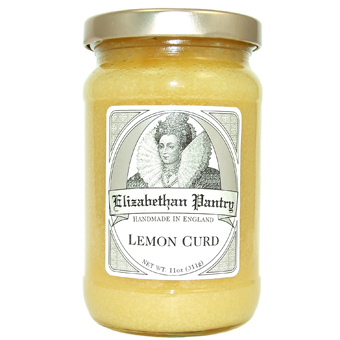 Handmade in Ledbury, England, Elizabethan Pantry's Lemon Curd is made in small batches using dairy butter and fresh eggs from the farmer down the road. It is a soft, thick, spreadable cooked mixture of eggs, sugar, lemon juice and butter, and is perhaps the most intensely flavored lemon curd we've found. It can be served as a spread for scones or toast, and goes well with tea at any time of day. It is also wonderful as a filling in trifles, tarts, and sponge cakes. Fabulous on pound cake, fresh fruit, ice cream...just about anything! 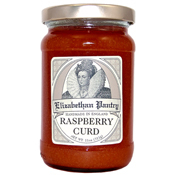 Elizabethan Pantry produces genuine stillroom recipes so popular during the reign of Queen Elizabeth I. What is a stillroom? It was the room where the housekeeper distilled essences and extracted oils from herbs and flowers to flavor recipes and make lotions and other household products. 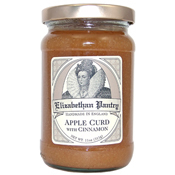 All Elizabethan Pantry products are hand-made in Ledbury, England, a thriving market town in rural Herefordshire, England. They are all natural, using only the freshest locally sourced ingredients.